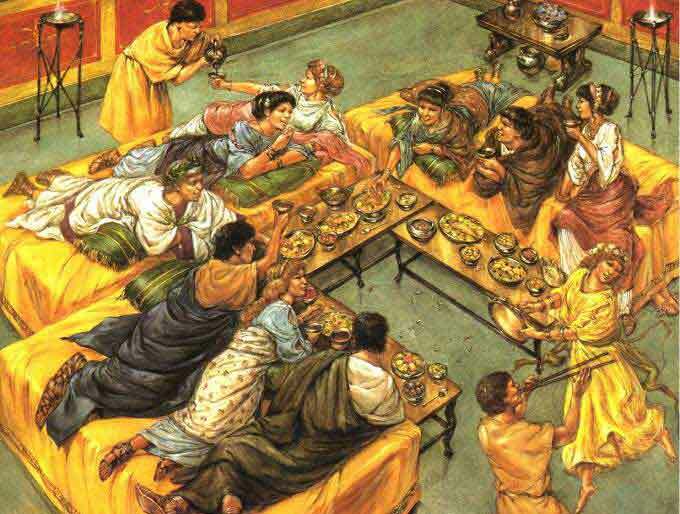 The affluent members of Celtic society had little choice in deciding their future status under the Romans. They had to either accept the new rulers and retain their standing in society, or have their properties taken from them and be cast out to live with the masses. 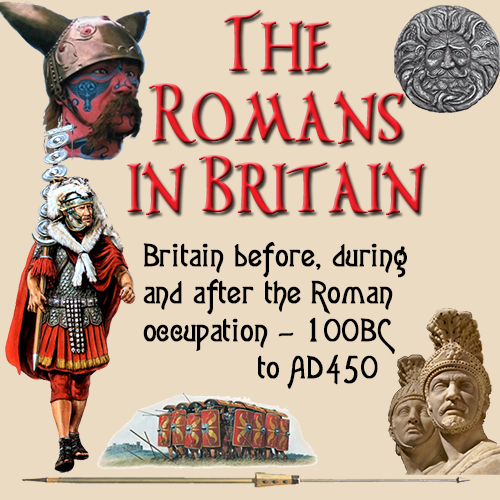 The converted upper classes were the ones who benefitted most by co-operating with the Romans. Under the new regime they could see their standard of life improve and they could partake in that great Roman ritual — the dinner party. For a someone with status in the community it was an accepted rule that the family would hold a regular dinner party. This was not just a gathering of friends for an evening meal, it a method of influencing those who could help the careers of the host. Like the a visit to the Roman baths, this was an occasion for mingling with local and regional dignitaries with a view to gaining their friendship and support. The meal was not just a mixture of items thrown together. Every course was meticulously planned so that every flavour in the meal was designed to be work with another. Appearance and flavour had to be just right. For each course there was a main flavour such as fish, beef, pork and the flavours of the food that accompanied each course had to accentuate the main flavour. Of particular interest is the liquamen. This is a sauce used in cooking and is important to the meal because it is used throughout the cooking process in a variety of dishes. Liquamen is made by mixing small fish with the organs and innards of larger fish and pounding them to near liquid form. Then the resulting pulp is then left in the sun to develop it's unmistakable taste. It was then pressed through cloth and the resulting juice was poured over the meat just before serving. By early evening the meal is ready. The dining room tables are rectangular in shape, low on the ground and surrounded on three sides by low couches. Place settings have been arranged and the tableware laid out. Bowls of fruit, jugs of wine and bowls containing tepid water for cleaning the hands between each course are placed within easy reach of all the guests. The tableware is meaningful to the overall impression. 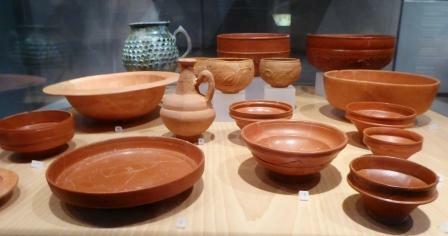 Items made of Samian pottery were considered the height of elegance and enhanced the reputation of the family. *For some great reproduction Samianware, please visit our good friend Julia Passamonti of Ventian Cat Studio — Julia makes really nice and usuable Roman dinner ware, along with a host of nice pottery items. As we have cookery books today, so did the Romans. The most famous cook was the first century Marcus Gavius Apicius who wrote many books on the subject. After the preliminaries of greeting and introduction are over everyone would head to the dining room and take their allotted place around the dining area. The starter is often fish. Haddock, herring, mullet and mackerel were popular. They would be gutted, then boiled and presented in a sauce of herbs with wine and honey. It was the norm for Roman sauces to be thick in texture. To achieve this they added wheat starch in much the same way we use cornflower today. A great delicacy was British oysters served in a sauce of lovage (a herb), vinegar, wine, oil and pepper. The hosts may have tried to impress their guests by choosing something more adventurous. The lark is a small British bird, and one dish the Romans were fond of was marinated larks tongues. About 1000 larks would be needed for this recipe. Meat was the most popular choice and usually red meat such as beef, pork or venison was used. This would have been roasted for most of the afternoon over an open spit above a wood burning hearth in the kitchen. Servants took turns to rotate the meat regularly and ensure it was cooked thoroughly an consistently on all sides. It was then sliced, had the prepared sauce poured over and placed onto china plates ready for serving. The Romans had very much the same vegetables as we do today. Cabbage, cauliflower, carrots, leeks, onions, parsnip. All these were prepared by boiling and served with the main course. With the coming of the Romans, Britain saw a marked increase in the variety of fruits that became available. This was evident at dinner parties by the way exotic fruits such as dates and figs made an appearance. The dessert was mostly fruit. Not just served on it's own but prepared to add extra flavour. Dates would be stuffed and fried. Apples would be soaked in a cream sauce. Pastries were in abundance. Some were more like biscuits in texture. There were made from flour and then cooked in oil and had lashings of honey and pepper poured over them. Those more inclined to try new ideas mixed the cakes with aniseed, cheese and the bark of a laurel twig that was grated. This whole combination would have been roasted over bay leaves. The three courses mentioned here are just basic. The actual dinner party usually consisted of several courses spread or a few hours with interludes in between courses for chatter, wine drinking and to allow the last course to digest. The dinner was accompanied by abundant amounts of wine consumed throughout the evening. After the meal, everyone would assemble in the main room and consume more wine. There would be readings from the classics, a poetry recital, talk of literature or the men would talk of business, where the host tried to impress those present with his knowledge and skill. 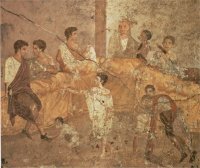 It was at this point the host would take his guests on a tour of the house and show them the mosaics, paintings and ornaments he had accumulated. All this was meant to give the impression of a man who was intellectual and articulate. Well suited to a higher office. When some of those assembled began to feel weary, the evening drew to a close. There would be a session of final farewells and the host would add a final touch by having a servant see the guests safely home. There was no street lighting, so the servant would carry a torch to light the way. It frequently took a while to get home as the wine had taken effect by now and the men would find their legs now had the supporting power of a jelly. But they eventually arrived home in one piece. The hosts meanwhile, had lit their oil lamps and were making their own way to their much needed beds.